Milton Friedman famously said “inflation is always and everywhere a monetary phenomenon.” And with the massive growth of the money supply in response to the Great Recession, monetary economists and financial commentators have been waiting—and waiting—and waiting for inflation to appear. Paul Krugman has labeled these claims as part of “The Inflation Cult” . And to be fair, conventional monetary economics (and economists) would argue that, all else equal, large increases in the money supply will cause inflation. But we haven’t seen that, even with the Fed’s historic actions, mainly because aggregate demand remains so low after the Great Recession, and because the massive debt accumulations that helped trigger the downturn are taking years to work through. But is the aftermath of the Great Recession a special case, meaning that conventional monetary theory would still be right most of the time? We present here an interesting analysis by Richard Vague, a successful banking executive and investor and also a scholar of debt and inflation. This research is part of a larger project on debt economics that emphasizes the risks of private debt accumulation. This specific historical study looks at 47 cases of rapid monetary growth in different countries, and finds that it is not associated with outbursts of inflation. The author has invited commentary and debate on his findings, and we present his study here in the hopes of stimulating further discussion. Monetarist theory, which came to dominate economic thinking in the 1980s and the decades that followed, holds that rapid money supply growth is the cause of inflation. The theory, however, fails an actual test of the available evidence. In our review of 47 countries, generally from 1960 forward, we found that more often than not high inflation does not follow rapid money supply growth, and in contrast to this, high inflation has occurred frequently when it has not been preceded by rapid money supply growth. The purpose of this paper is to present these findings and solicit feedback on our data, methods, and conclusions. To analyze the issue, we developed a database of 47 countries that together constitute 91 percent of global GDP and looked at each episode of rapid money supply growth to see if it was followed by high inflation. In the majority of cases, it was not. In fact, the opposite was true—a large percentage of the cases of high inflation were not preceded by high money supply growth. These 47 countries all rank within the top 70 largest economies as measured by GDP and include each of the top 20 countries. If a country was not included, it was because we could not get a complete enough set of historical data on that country. There are several reasons to want to better understand the causes of inflation. Currently, central banks in Japan, Europe and elsewhere are trying to engender a moderately higher level of inflation in order to stave off the drift toward deflation and under the belief that it will add to job and economic growth. Also, both public and private debt have reached such high levels in ratio to GDP that some policymakers are beginning to reflect on potential paths to deleveraging, and inflation is one such path. Lastly, a number of countries are trying to moderate levels of inflation that are deemed too high. For these countries, too, a deeper understanding of the mechanisms of inflation is important. Two, as a period of five consecutive years of inflation of five percent or more. Case 1. M2 increase of 20% to GDP followed by 3 years of 5% inflation. Case 2. M2 increase of 20% to GDP followed by 5 years of 5% inflation. Case 3. Nominal M2 growth of 60% followed by 3 years of 5% inflation. Case 4. Nominal M2 growth of 60% followed by 5 years of 5% inflation. Case 5. Nominal M2 growth of 200% followed by 3 years of 5% inflation. Case 6. Nominal M2 growth of 200% followed by 5 years of 5% inflation. For each of these six cases, we then reviewed the data for all 47 countries to see how many times high inflation followed high M2 growth, and how many times high inflation occurred that was not preceded by high M2 growth. We considered high M2 growth to have preceded high inflation if the period of high M2 growth was immediately before the period of inflation or that period was coincident with the start of high inflation. So, for example, if a period of high M2 growth was recorded from 1960 to 1967, we considered it to have triggered a period of high inflation if that high inflation period started at any point from 1960 to 1968. We found that in none of these six cases was high M2 growth a reliable predictor of inflation. Our results were as follows (See Chart 1). In Case 1, there were 54 instances where M2 to GDP growth was at least 20 percentage points in five years. Only three of these were followed by a three-year period of high inflation and 51 were not. By contrast, there were 49 instances of high inflation that were not preceded by high M2 growth. In Case 2, of 54 instances where M2 to GDP growth was at least 20 percentage points in five years, only one was followed by a five-year period of high inflation. 53 were not. By contrast, there were 37 instances of high inflation that were not preceded by high M2 growth. Cases 5 and 6 underscore the lack of a causal relationship between rapid M2 growth and high inflation, because when we increase the threshold of nominal M2 growth to from 60 percent in five years to 200 percent in five years, it is followed by high inflation even less frequently than in Cases 3 and 4. This is, of course, the opposite of what one would expect if high M2 growth causes high inflation. In Case 5, we defined high M2 growth as 200 percent nominal growth in five years, and high inflation as a period of three consecutive years of 5 percent or more inflation. Of the 30 such M2 booms, only seven led to high inflation and 23 did not. By contrast, there were 45 instances of high inflation that were not preceded by high M2 growth. In Case 6, we defined high M2 growth as 200 percent nominal growth in five years, and high inflation as a period of five consecutive years of 5 percent or more inflation. Of the 30 such M2 booms, only seven led to high inflation and 23 did not. By contrast, there were 30 instances of high inflation that were not preceded by high M2 growth. Please note for the 3y 5% nominal cases, there were 2 instances where the data was not fully complete, however still led to high inflation; it was not counted in the 20% to GDP. These results did not change appreciably when we divided our test cases into large, medium, or small countries. For example, when we looked only at the top 10 countries as measured by GDP instead of the entire 47 countries in our database, the results were similar. Of the 15 instances where M2 growth was at least 20 percentage points in five years, only one was followed by a period of high inflation, while 14 were not. Yet there were 11 instances of high inflation that were not preceded by this level of high M2 growth. 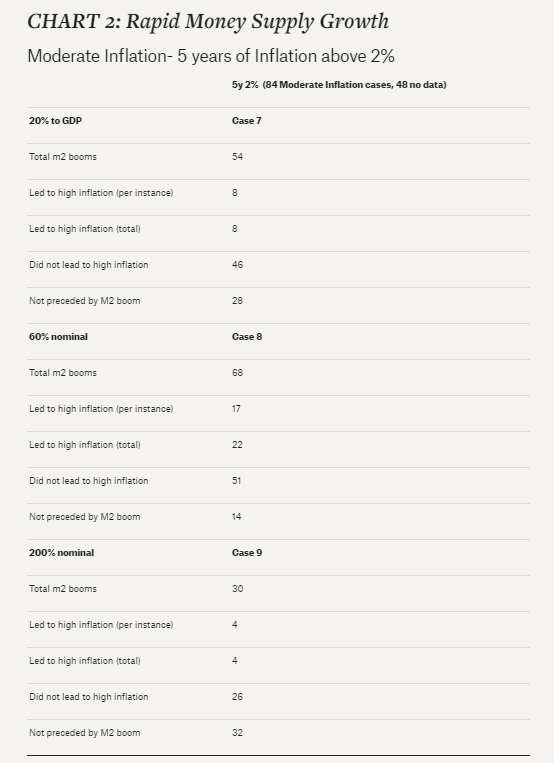 -In case 7, of the 54 instances where M2 to GDP growth was at least 20 percentage points in five years, eight were followed by a period of moderate inflation and 46 were not. By contrast, there were 27 instances of moderate inflation that were not preceded by high M2 growth. -In case 8, of the 68 instances where nominal M2 growth was at least 60 percent in five years, seventeen were followed by periods of moderate inflation, and fifty-one were not, yet there were fourteen instances of moderate inflation that were not preceded by this level of high M2 growth. Thus, we could find no evidence that rapid money supply growth leads to even moderate inflation. The detail supporting our findings can be seen at http://privatedebtproject.org/inflation-data.php In addition, a somewhat more robust set of data on each of the 47 countries in question can be found at www.debt-economics.org/review-data.php. The data in these spreadsheets is largely a compilation of data that can be readily obtained from sources such as the Bank of International Settlement, the Federal Reserve, the World Bank, CEIC, and the International Monetary Fund. We tried many variations not shown here for each of these factors and always came out with similar results. For example, in one case our definition of rapid money supply growth was a 2400 percent nominal growth in M2 in five years. In another case, we defined rapid money supply growth as 45 percent “real” growth in M2 in five years. We also used several slightly different definitions of how soon or late inflation had to begin relative to high M2 growth to be considered as following high M2 growth. In each of these alternative cases, the results were similar—high inflation rarely followed high money supply growth and, in contrast, high inflation occurred often when not preceded by high money supply growth. We only used and counted cases where we had all the data, and of course for some countries in some periods we did not have complete data. Overall, we had inflation data for each of the 54 instances of high M2 growth; however, for the 65 instances of high inflation as defined above, we had M2 data for only 39 of them. Although less often discussed than money supply growth, economic commentators also often mention high rapid government debt growth as a cause of inflation. A more recent variant of this is the case when a central bank is active in purchasing government debt or bank loans—what is commonly called quantitative easing—with the result of high balance sheet growth. Some economists have argued that this too will bring inflation. Some also suggest that rapidly declining or low interest rates are a cause of high inflation. We tested all three of these theories. We followed the method used above in assessing whether rapid government debt growth leads to inflation. We defined a period of rapid government debt growth in two ways. One was to define it as 20-percentage point growth in government debt to GDP in a five-year period, and the second was to define it as 200 percent nominal growth in government debt growth in a five-year period. We defined high inflation as a period of five consecutive years of inflation of five percent or more. Then we reviewed the data for each country to see how many times high inflation followed high government debt growth, and how many times high inflation occurred that was not preceded by rapid government debt growth. Our results on government debt were as follows. In case 10, of the 47 instances where government debt growth was at least 20 percentage points in five years, six were followed by periods of high inflation, while 41 were not. By contrast, there were 25 instances of high inflation that were not preceded by this level of rapid government debt growth. In case 11, of the 85 instances where nominal government debt was at least 60 percent in five years, 17 led to high inflation, 68 did not. There were 9 cases of high inflation that were not preceded by a public debt boom. 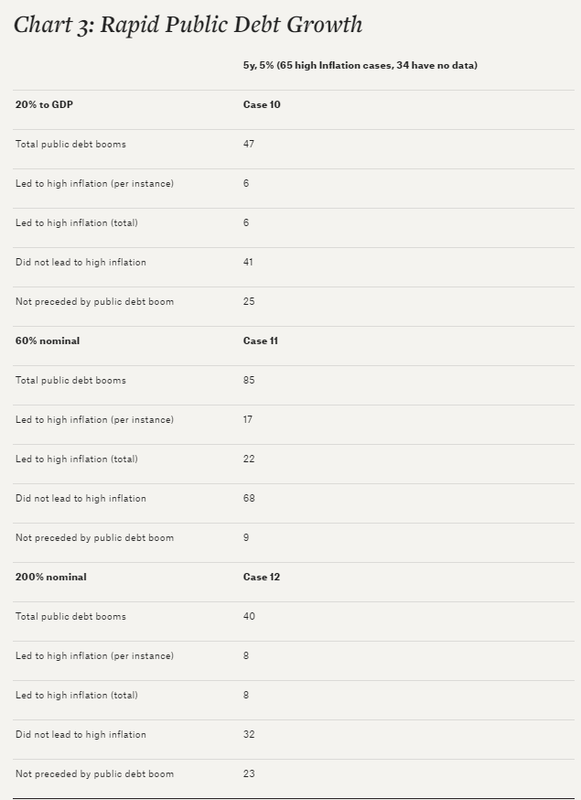 In case 12, of the 40 instances where nominal government debt growth was at least 200 percent in five years, eight were followed by periods of high inflation; 32 were not. There were 23 instances of high inflation that were not preceded by this level of high government debt growth. We also followed this method in assessing whether declining interest rates lead to inflation. Specifically, we defined a period of declining interest rates as a five-percentage-point decline in interest rates in any consecutive five-year period. The rates used were the prevailing market lending rates, or, if that data were not available, we used a government debt rate, usually a government treasury bill rate (maturity of less than a year). Again, we defined high inflation as a period of five consecutive years of inflation of five percent or more. Then we reviewed the data for each country to see how many times high inflation followed declining interest rates, and how many times high inflation occurred that was not preceded by declining interest rates. Our results were as follows. Of the 70 instances where rates declined by five percentage points or more in any consecutive five-year period, four were followed by periods of high inflation; and 66 were not. There were 17 instances of high inflation that were not preceded by this level of rate decline. We also looked at a five-year decline in real interest rates of three percentage points or more. Out of 115 total such cases, 11 led to high inflation, and 104 did not. There were 17 instances where there was no preceding period of a declining real interest rate. The data set for our analysis of growth in central bank balance sheets was not as large since there are relatively few large central banks. Here, we took only the five largest central banks, namely the Federal Reserve, the European Central Bank, the Peoples Bank of China, the Bank of Japan, and The Bank of England, and used balance sheet data back to 1915, 1999, 2002, 1999, and 1706 respectively. We noted where there was balance sheet growth to GDP of more than 10 percentage points in a five-year period. Of the seven such occurrences, none were followed by high inflation. There were six instances of high inflation that were not preceded by this level of increase. We also noted where nominal central bank total assets grew by 100 percent over a five-year period. Of the 12 such occurrences, one led to high inflation, 10 did not, and we did not have inflation data for one occurrence. There were five instances of high inflation that were not preceded by this level of growth in nominal assets. We invite our readers to analyze our work as presented in the websites mentioned above. We would welcome any comments, observations or suggestions for modifications to our analysis. Any such comment can be sent to the author at rvague@gmail.com . If our observations hold, there are several implications. The most relevant of these seems to be that the current efforts of central banks to engender inflation are unlikely to be successful. Central banks are correct in one thing: namely, in their view that stronger loan growth would add to economic growth; after all, private loan growth is a core determinant of GDP growth. But under most circumstances monetary policy has a relatively low impact on loan growth, ranking behind actual demand from borrowers (which is in part a function of how leveraged they are and therefore their capacity for more debt), the credit policy of lenders, and the capital requirements on those lenders. This leaves unanswered the question of what causes inflation? There is of course a vast literature on this subject. Our review suggests that inflation appears more frequently in less developed countries, and that the causes of individual cases vary but generally include such factors as imbalances between supply and demand, including supply shocks on the one hand and private credit-induced demand on the other; currency exchange rates, which can cause the import of inflation; and considerations relating to the politics and political stability of the country. I have touched on the particular role of inflation in debt deleveraging in an article on private debt in The Democracy Journal . As an outgrowth of our overall work on these macroeconomic questions, we are now developing a view of the causes of inflation that would include a variety of macroeconomic factors. However, given that the conclusions on inflation put forward in this article are outside of conventional economic thinking, we are interested in receiving your feedback on these observations so we can further refine our thinking. Based on our examination of countries that together constitute 91 percent of world GDP, we suggest that high inflation has infrequently followed rapid money supply growth, and in contrast to this, high inflation has occurred often when it has not been preceded by rapid money supply growth. The U.S. economy may well experience some increase in inflation in the coming year, but if it does, it is likely it will be due to factors other than monetary policy. I would welcome any and all feedback and look forward to your input.